The claims over the packaging of a fast food chain are a reminder of how far the Chinese public’s choices reach. After months of preparation, Yang Jie finally took her place in front of a busy KFC restaurant in Beijing’s Chaoyang district with two fellow activists who were dressed as homeless orangutans living in giant KFC chicken buckets. They held banners that read, “My forest home is NOT your disposable food packaging!” A third activist dressed as a tiger lay sprawled at her feet, victim of deforestation. In a steady voice she began to explain to the throng of journalists and bystanders who had gathered around why she and the other volunteers were here. Greenpeace had recently published test results that suggested a link between KFC’s fast food packaging, including that in China, and Asia Pulp & Paper (APP) mills. The results were reported by media around the globe. 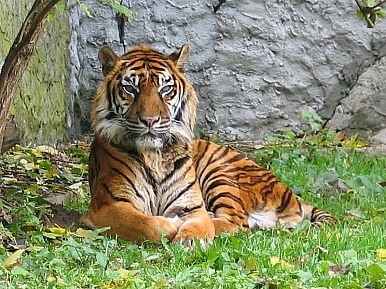 The mills are allegedly fed from Indonesia’s Sumatra peat swamp forest, contributing to the endangerment of the Sumatran tiger. Yang had come to deliver the report to the store’s manager. China is no longer simply the factory of the world. The world’s second biggest economy has also become the shopping mall of the world, with the consumer choices of China's swelling middle class now a huge driving force behind global production. But with power, comes responsibility. And when the fast food munching ways of 1.3 billion Chinese citizens are destroying hectares of Indonesian rainforest by the day, how will the country respond? KFC has long been heralded as the success story when it comes to foreign companies planting their flag in Chinese soil. Last year, profits from parent company Yum’s 4,500 restaurants in China, mostly KFC outlets, reached $908 million. This makes up half of the company’s 2011 operating profits, and outstrips by a mile their U.S. profits of $589 million. It’s hard to believe that China’s KFC stores now top the profits of all of the United States’ Taco Bell, KFC and Pizza Hut stores put together. And where corporations go, corporate watchdogs must follow. KFC’s winning strategy, which saw them “adapt to the Chineseness of China without losing the advantages of foreignness,” has been widely documented, and international, environmental organizations should take note. How to leverage the trust and quality that is associated with a foreign name, while employing a deep understanding of the language and culture that goes beyond lip service? In the history of Greenpeace’s 14 years in China, campaigns with strong ties to human health have traditionally garnered the greatest public attention: air pollution, toxic chemicals in toys, illegal pesticide use in tea. Which makes a campaign such as this, linking fast food packaging to deforestation in Indonesia, particularly challenging. Not only does it lack an immediate or direct impact on human health, the environmental destruction isn’t even taking place in China. In the pull-and-tug game of China’s sustainable development, too much muscle has lain on the side of development, rather than sustainability. But the ongoing and growing successes of some campaigns are signs that environmentalism – as a mindset, and a set of values – is beginning to bloom in this country. And it couldn’t come any sooner. While China may be a country beset by internal, environmental problems, as global brands invade the country and the demands of a rising middle class set the tone for global production, Chinese consumers are quickly finding they also have both a responsibility – and opportunity – to change the world beyond their borders. Indeed, a new Gallup poll saw 57% of Chinese adults surveyed say that protecting environment should be given priority, even if this risks curbing the country's economic growth. And only 21% believed economic growth should trump environmental protection. Monica Tan is a writer and Beijing-based web editor for Greenpeace East Asia. The views expressed in this article reflect those of Greenpeace. Beijing’s typically polluted skies reached new heights over the weekend. Could this be a catalyst for change?